Health law and policy in Nigeria is an evolving and complex field of law, spanning a broad legal landscape and drawn from various sources. In addressing and interacting with these sources the volume advances research on health care law and policy in Nigeria and spells the beginning of what may now be formally termed the ’Nigerian health law and policy’ legal field. The collection provides a comparative analysis of relevant health policies and laws, such as reproductive and sexual health policy, organ donation and transplantation, abortion and assisted conception, with those in the United Kingdom, United States, Canada and South Africa. It critically examines the duties and rights of physicians, patients, health institutions and organizations, and government parastatals against the backdrop of increased awareness of rights among patient populations. The subjects, which are discussed from a legal, ethical and policy-reform perspective, critique current legislation and policies and make suggestions for reform. 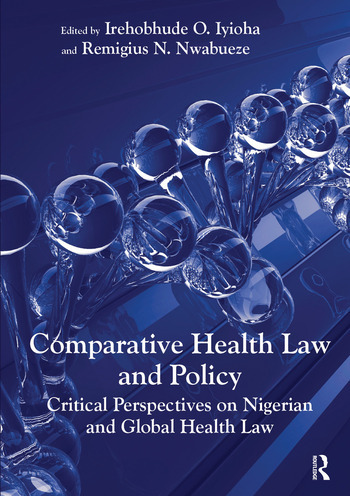 The volume presents a cohesive, comparative, and comprehensive analysis of the state of health law and policy in Nigeria with those in the US, Canada, South Africa, and the UK. As such, it provides a valuable comparison between Western and Non-Western countries. Irehobhude O. Iyioha is a Senior Policy Analyst / Health Professions Policy Consultant with Alberta’s Health Ministry (Alberta Health, Canada) and an Assistant Adjunct Professor in Health Law, Ethics and Policy at the John Dossetor Health Ethics Centre, Faculty of Medicine and Dentistry, University of Alberta. She researches and writes primarily on health law and policy with a keen interest in health systems governance, health professions regulation, medical negligence and medical pluralism. Her work constantly explores the boundaries of health law and other fields such as immigration, patents and biotechnology, and social and legal theory. She has published widely on these and related areas. Remigius N. Nwabueze is an Associate Professor of Law at the University of Southampton. His research interests are in the areas of property law (equity and trust), intellectual property law, law and the human body, medical/health care law, bioethics and customary law. He has published widely on these and related areas.